Gone are the days of the writing being on the wall... metaphorically and literally. Although I have fond childhood memories of proudly charting my growth on the wall in our pantry, with permanent ink nonetheless, renting a place doesn't lend itself to marking up the walls for posterity. 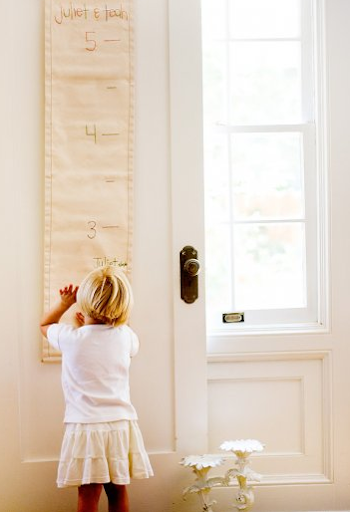 And besides, it gives us a great excuse to find or make an adorable growth chart. Tiny Sprouts' grow-with-me chart is simple and elegant and will fit in with any decor. It is made of easy to write on canvas cloth, and it is hand-embroidered with numbers and your child's name. It also comes in many hues, ranging from grape to sunshine if you'd like to coordinate it with your space. One of the best features is that it rolls up easily, so your children may tote it with them as an heirloom. See? That's much easier than having to knock down and move a wall. If you're not in the market to shell out for this chart, I also think it provides great inspiration for a DIY growth chart project!